At Bluebird Day Vacation Rentals we represent a choice selection of homes believing that personality, character, unique amenities, and ideal location are the key to optimizing a vacation experience. 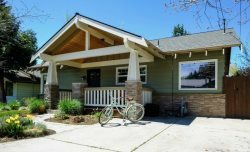 Our thoughtfully curated collection of homes are located in Bend's most desirable neighborhoods. From Mid-Century Modern chic to Industrial Modern, Prairie Contemporary, Historic Craftsman Bungalow, artsy and eclectic Mill Cottage... each property portrays unique characteristics of our treasured Bend heritage while sharing consistent amenities such as European style bedding, and gourmet-equipped kitchens. This approach gives a returning guest a unique selection of experiences to choose from while knowing exactly what to expect in terms of quality and comfort. We provide our property owners with a strategic plan for achieving the highest possible return on their vacation home investment. Actively engaged in community happenings, we have our "fingers on the pulse" of changing market conditions and trends, both long-term and short-term. We offer the necessary flexibility to adapt not only to long term cycles, but to month to month conditions such as changes in the weather and snow pack levels, as well as festivals and sponsored events. At Bluebird Day Vacation Rentals we offer turn key vacation home set-up and interior design services. We are continually inspired to appreciate and accentuate the unique character of each property we manage. Nothing thrills us more than to see the hidden potential in a home and to bring it forth for others to experience and enjoy! Our interior and exterior design services reflect an authentic Bend style of living defined as "natural contemporary" with a Pacific Northwest flair. This style promotes optimum comfort and functionality incorporating natural elements that highlight the beauty of our magnificent surrounding landscape. Contemporary colors and furniture pieces are blended with period pieces that tell a story of Bend's unique history. All of the design we implement serves as an enhancement of the specific home, its landscape and neighborhood, playing upon key elements of the home's individual story and personality. Check to see if your rental has a hot tub or cruiser bikes! Looking to Purchase a Vacation Home?